Inside Turnabout was recorded in Malmo,Sweden in February 2017. 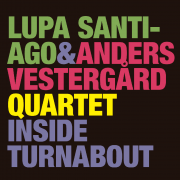 It was supposed to be a second tour of the first album, but ended up being a new group with new compositions from Anders, Lupa as well as the Brazilian sax player Rodrigo Ursaia. Rodrigo had a long partnership with Lupa, and a cd recorded in 5tet. Anders listened to this work and found the identification of Rodrigo’s sound with his compositions . Both Brazilians were touring Europe and was a good chance to experiment with new repertoire and new group so Anders called the great bassist Mattias Hjorth, that has an amazing groove and deep knowledge of the contemporary jazz language and added a lot to the recipe. The result is an álbum of very fresh compositions, challenging harmonies and different grooves mixing latin, Brazilian, and hybrid rhythms, an open invitation for the listener to dive into!